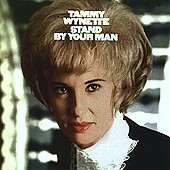 Originally released December 23, 1968, the song "Stand By Your Man," on the album of the same name, was the first of twenty number one hits which would establish Tammy Wynette (born Virginia Wynette Pugh) as the "First Lady" of country music. On this re-mastered and expanded version (including "I'm Only A Woman" and "There's Quite A Difference"), Tammy's heartache, ill-fated marriages, and universal pain never felt so touching. Opening with "Stand By Your Man," the song that virtually made Tammy Wynette's career, it sets the tone for a beautifully painful, delicate, and emotional album that is as tender as it is universal. As her heart talks through songs like "Forever Yours," "It Keeps Slipping My Mind," "Cry, Cry Again," and "If I Were A Little Girl," Tammy seems to ease the pain of her own pain while soothing over the listener. Then there are songs like "Joey," "I'm Only A Woman," and the eternally forgiving cry of "My Arms Stay Open Late," in which Wynette seems to reveal her pain while reminiscing on the good times that eventually lead to the disastrous marriages and failed attempts at love. This album is soft, tender, and about as emotionally potent as an album can get. At times, though she is singing about losing or loving her man, you can't help but feel, with a few slight lyrical changes, she is speaking from your heart. The realism, the ability to touch you like no other, and the striking voice that marks her music (and not to mention her soft spot for love), all help create a sonically beautiful album that will never become obsolete. As long as there is human emotions, there is room for Tammy Wynette. I'll give this album an A+.